Her mouth was so full she could barely speak. She was stuffing it with everything in sight. In those examples, the words “she is hungry” was never mentioned, however, you can infer that person is hungry based on the details given. This week, my little love bugs and I created an anchor chart showing a wide range of emotions and what people look like when they feel that way. 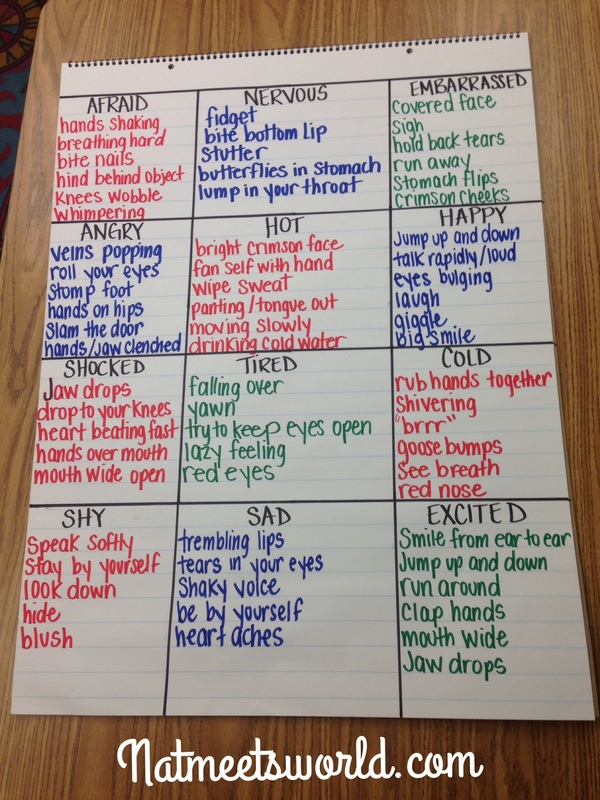 We listed the emotion in black, then used a colored marker to write the characteristics of that feeling underneath it. Once we completed it, I assigned a different emotion to each group of two in my class. Students were told to keep their emotion a secret. They had to write a story showing that emotion. When they shared it with the class, everyone had to guess what emotion each team wrote about. I have to say, my kids were very intrigued and they really had fun trying to make it challenging for their classmates to guess their emotion. Remember that if you are not a teacher, you can still practice this technique with your little love bug at home. It is never too late or too early to teach them what emotions look like, or how to model their writing by ‘spicing’ it up some. If you have any questions, post them below! « Valentine Simile Activity With Pop Rocks!